Vitamin D is sometimes called the “sunshine vitamin” because it’s produced in your skin in response to sunlight to protect itself from the sun’s rays. Vitamin D is a fat-soluble vitamin in a family of compounds that includes vitamins D-1, D-2, and D-3. Vitamin D can affect up to as many as 2,000 genes in the body. Vitamin D has several important functions with possibly the most vital functions of regulating the absorption of calcium and phosphorous, and facilitating normal immune system function. Getting a sufficient amount of vitamin D is important for normal growth and development of bones and teeth, as well as improved resistance against certain diseases. If your body doesn’t get enough vitamin D, you’re at risk of developing bone abnormalities such as fragile bones (osteoporosis) or soft bones (osteomalacia). 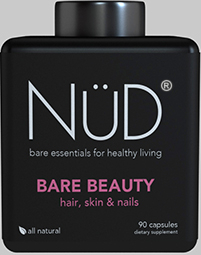 Consider adding Vitamin D supplements (NÜD Bare Beauty) to your diet if you’re trying to lose weight or prevent heart disease. If you’re diagnosed with a vitamin D deficiency, your doctor will likely recommend you take daily Vitamin D supplements (NÜD Men’s MultiVitamin). If you have a severe deficiency, they may recommend you take high-dose vitamin D tablets or liquids. You should also make sure to get vitamin D through sunlight and the foods you eat. Your body produces vitamin D naturally when it is directly exposed to sunlight. A little can go a long way. All you need is 10 minutes a day of midday, pre-sunscreen sun exposure, especially if you have fair skin. Of course, if you’re going to expose yourself to sunlight without sunscreen, moderation is key. Milk (fortified) – however, possible side effects could negate benefits of Vitamin D when consumed in Milk. It can be hard to get enough vitamin D each day through sun exposure and food alone, so taking Vitamin D supplements (NÜD Women’s MultiVitamin) can help. Some sources suggest that considerably higher daily amounts of vitamin D are needed, and although the exact amount may be in question, the importance of Vitamin D is not. Talk to your doctor for guidance on how to ensure you get the right amount for your body.